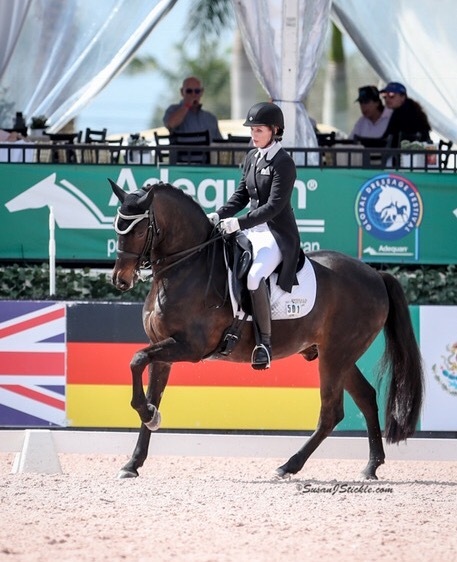 This past winter, USPRE Copa Champion and USPRE Dressage Team member Jacqueline Cuddy debuted her top-scoring national-level Grand Prix PRE Malcarat in the demanding International rings at Global Dressage. The pair are competing for Great Britain. With consistent scores in the mid-60s, the crowd-pleasing pair went home with many lessons learned. The experience in the big ring and continued top training has paid off in outstanding scores this spring and summer in the national show circuit in Florida. In April, at the Cinco de Mayo Dressage show, Jacqueline and Malcarat scored 71.6% in the Grand Prix and over 68% in the Special. In June at the Sun Coast Sunburn Classic II, the pair brought home a record-topping 75.5% at the Grand Prix, from judge Fran Dearing-Kehr! Jacqueline is clearly focussed on the next International season, and bringing her lovely, talented Malcarat back to Wellington with winning on her mind! Photos with permission from Susan Stickle.